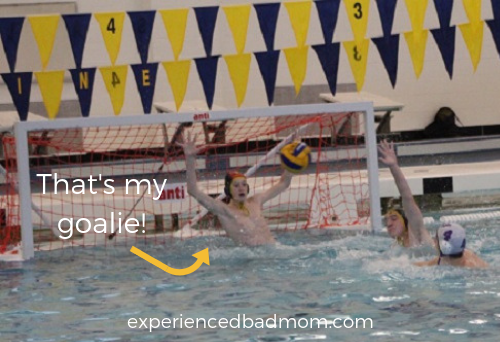 My son, 15, joined his high school water polo team this fall. I laughed and laughed. This was the kid that hated getting his face wet when he was little! And now he was in the pool 5 nights a week and 3 mornings a week for 2 fun-filled months. Now, as a former high school basketball and soccer player myself, I never had two-a-days, aka morning and night practices in the same day. But in water polo it’s considered normal. Wanna know what else is normal in water polo? Team breakfasts after the morning work out. “Fine. Eat away!” I thought. Which means I suddenly had to feed nummies to 23 starving teenage boys at 7 am. The good news is that I only had to sign up once during the season. The bad news is that I had to provide each boy with one hot item, a piece of fruit, a granola bar or protein bar, and Gatorade and chocolate milk. I asked other parents, checked Google, and searched Pinterest for ideas. I’d say Google was the most helpful, but really, there is a dearth of water polo team breakfast ideas out there, folks! It was also challenging finding a breakfast casserole without onions, as requested by my picky-eater, and deciding whether I should go the slow-cooker or casserole route. In the end, I settled on this recipe. Then I gallantly spent $45 and one evening making 2 egg and hash brown casseroles to heat up at 5 am. My husband and I schlepped everything to the pool deck bright and early. And, in 48 seconds the boys devoured everything. My son reported that the casserole was well-received. Next year I’ll make 3 pans, not 2. I might also make mimosas for me and my husband. 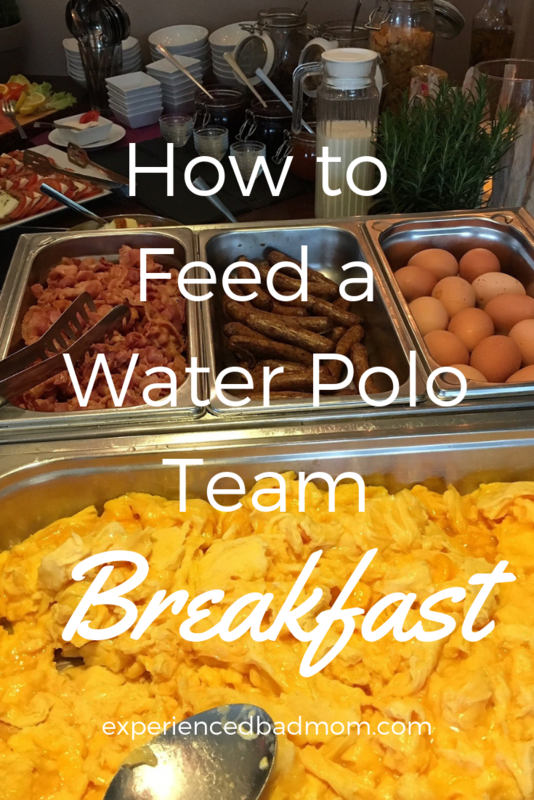 Then I can really get behind the water polo team breakfast thing! What have you done for your kids’ sports teams lately? I was hoping you were wise and had fed many, many swim (or other) teams before me, Kelly! I guess you make those kids work for their own breakfasts in the Great North, eh? Wowzers!! Yup, you’re right, I saw it coming. But oh my, I didn’t know what breakfast for the team would entail. Although, because of the Olympics I know that swimmers can eat—lucky!